Cologne - From the moment Bayer 04 Leverkusen scored the fastest goal in Bundesliga history on Matchday 1, the 2014/15 campaign has been a roller-coaster ride for the Werkself. The Rhineland club have since been top of the league, playing some thrilling football both domestically and in Europe, beating SL Benfica but losing heavily to VfL Wolfsburg and dropping points against lowly SV Werder Bremen and newcomers SC Paderborn 07. Consistency appears to be lacking for them, but there is no doubt that Leverkusen are one of the chief sources of entertainment under new coach Roger Schmidt. In an exclusive interview with bundesliga.com, Stefan Kießling explains how the players have adapted to a new playing philosophy and how determined they are to lift a trophy this term. bundesliga.com: Stefan Kießling, with a lot of players on international duty and youth players making up the numbers, what is team training like at the moment? Stefan Kießling: It's certainly different, but I personally enjoy international breaks because it’s a chance to recharge your batteries. We're obviously still taking training seriously, but you can take things a little easier, which makes a nice change. bundesliga.com: It sounds like a huge contrast to the intense, high-level pressing game Leverkusen have been playing this season. How has new coach Roger Schmidt changed Bayer's style? Kießling: A key element of our game is to attack the opposition deep in their own half, put them under pressure and win the ball back quickly, and that often leads to chances. We've been working really hard in pre-season to understand the new system. So far the change looks like it’s paying off, although we could maybe have picked up a few more points. bundesliga.com: Why have Leverkusen given away points so easily in some games? Kießling: The Bundesliga has become very competitive. Even against smaller clubs you're anything but guaranteed three points nowadays, just look at our draw at home to Paderborn last week. They're very good tactically and facing a hard-working team like that during an Englische Woche can be particularly tricky. bundesliga.com: Do you think you are benefiting personally from Leverkusen's attacking approach? Kießling: Most definitely, yes. As a striker you're much more involved. Firstly because you're the first line of defence and secondly because the team is much more likely to create chances. Kießling: It certainly is. Every one of us has to cover a lot of ground to help regain possession quickly, but the thought of winning the ball helps. It gives you a real boost and makes all the running much easier, especially when you see it pay off by creating a goalscoring chance or maybe even going on to win the game. bundesliga.com: Is it possible to maintain such a high work rate over the course of an entire season? Kießling: I believe it is. Professional football has become very intense anyway, a lot more than it used to be. We've just played seven matches in something like 22 days. Obviously it's tiring, but that's the case no matter what system you're playing. bundesliga.com:Hakan Calhanoglu and Karim Bellarabi have been making quite an impression recently. 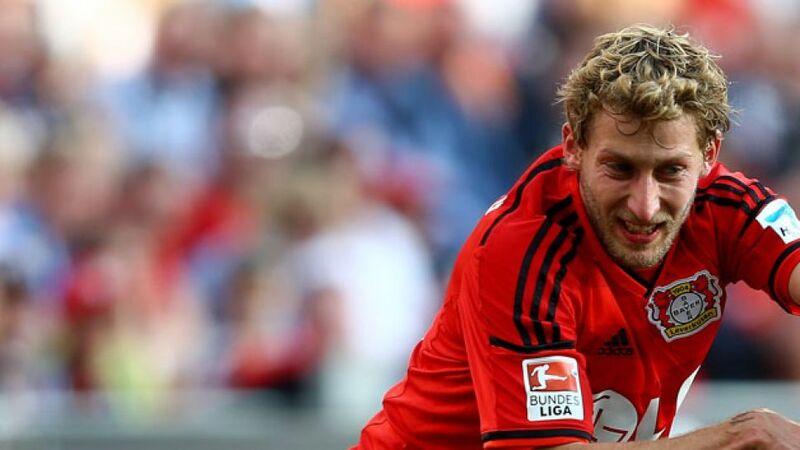 How much of an influence have they had on Leverkusen's promising start to the season? Kießling: They're two players who can make a difference and they've shown it on several occasions. Hakan is a fantastic footballer with a good eye for pass, a great shot and superb technique, while Karim also has huge potential. He's incredibly quick, good both feet and he's really good technically as well. They're the kind of players that can help anyone's attack. bundesliga.com: Could this be the strongest Bayer team you've played in? Kießling: I'd be careful using a label like that because we haven't won anything yet, and previous Leverkusen teams did very well too. We were runners-up three years ago, for example, and we reached the DFB Cup final in 2009. We need to make sure we play to our potential throughout the campaign and then I'm sure we'll be able to achieve great things. We're still lacking that cutting edge at times, as the draws against Bremen and Paderborn showed. bundesliga.com: What are the “great things” you refer to? Kießling: We have to try and remain in contention for the top spots, and we want to keep playing good football. We want to reach the last 16 of the Champions League and maybe with a little bit of luck we can progress even further. We also want to reach the Cup final. You don't need to win many games to get far in that competition. bundesliga.com: Is that one of the reasons you've only scored once in the league this season whilst finding the net four times in Europe? Kießling: To be honest, I’m not really too bothered about whether I score or not. I know I'll start scoring in the Bundesliga before long, but you don’t have to score to make a contribution. I'd be happy if I didn't find the net again this season as long as I can help the club be successful.